Home Drag Racing News Paul Summers’ Stars-And-Stripes, COPO-Powered ’69 Nova Is A Looker! Paul Summers’ Stars-And-Stripes, COPO-Powered ’69 Nova Is A Looker! Claremont, California racer Paul Summers turned his dream into a reality earlier this season when he debuted the latest rendition of his gorgeous 1969 Chevrolet Nova, complete with power from a supercharged GM LSX plucked right from the COPO Camaro assembly line. The show-quality Nova is, surprising as it may seem — and even perplexing to some — the product of what was already a show-winning car. LSX Magazine spotted the previous incarnation of the then-LS1-powered Nova at the 25th Annual Veterans Memorial Car Show in Loma Linda, California back in 2015, and to say it was a looker would be an understatement. “People think I was an absolute idiot for tearing that car apart. But I couldn’t find what I wanted, so I had to use this car and build it,” Summers says. With only the quarter panels, roof, and the Smith Racecraft front-end left from the original car, Summers tabbed Tony Mandella and his team at PMR Race Cars in California to craft a 25.2-certified chassis. PMR utilized carbon fiber and aluminum in its interior to keep the fighting weight at a relatively nimble 2,800-pounds, thanks in part also to the fiberglass front-end, doors, and decklid. PMR spent about 15 months constructing the car, completing it in time for Summers to earn license this summer at Auto Club Dragway in Fontana. 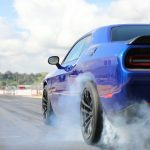 Intent on doing something unique with the powerplant — and with a focus on cost, simplicity, and longevity — he ordered a complete, 350 cubic-inch 2017 COPO Camaro engine package with a 2.9-liter Whipple supercharger and installed it right into the chassis, untouched. 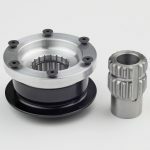 The engine is backed by a COPO-spec ATI Turbo 400 and converter and transfers out to a Mark Williams center section inside a PMR-fabricated 9-inch housing. JRi shocks in the rear and Santhuff shocks and springs up front plant the power through Weld Racing Alumastar wheels and Mickey Thompson rubber. A Holley Dominator EFI ECU manages the engine, and a Racepak dash and data recorder provide the telemetry during and after the run. 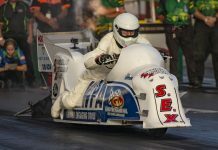 Summers has been drag racing since high school, competing in local high school drags programs in Washington before taking a hiatus to enter the United States Air Force, for which he served from 1989 to 1994. 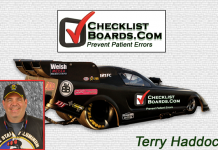 While stationed in Idaho, he worked part-time at the Firebird Raceway in Boise and befriended a number of racers during their visits, including a couple of Top Alcohol Dragster and Funny Car teams. 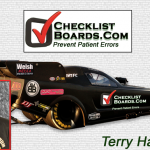 A stint as a full-time crewmember earned him valuable experience, and upon moving to California he put it to use traveling the country with Jason Rupert and his nostalgia nitro Funny Car operation. To say racing is in his blood would be an understatement, and while he’d been down the track plenty of times, never before had he owned or driven a car of this magnitude. With a supercharger pulley change — to date the only adjustment he’s made to the LSX mill — Summers has been a best of 7.95 at 170 mph. Summers and his Nova in its previous, show-winning form. 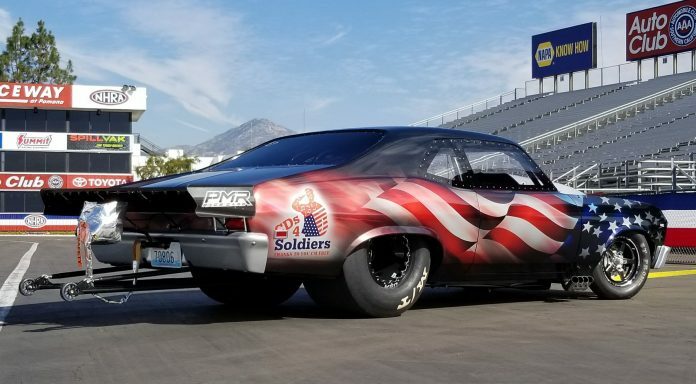 The car is primarily utilized for fundraising purposes for the military, being displayed at car shows and fundraisers — marking the fundamental purpose for the stars-and-stripe wrap that gives the car it striking appearance. Summers debuted the car at the NHRA Lucas Oil divisional in Las Vegas last month and qualified in Top Sportsman. He’s cited nostalgia A/Gas competition or perhaps grudge racing as a potential landing-spot for his future racing endeavors, if not NHRA Top Sportsman. Still tagged and licensed, the Nova is indeed street-worthy, but Summers says he’s foregone that use citing the ‘zoomie’ headers and large slicks that would likely draw the ire of California DOT. DragzineDragzine – Paul Summers’ Stars-And-Stripes, COPO-Powered ’69 Nova Is A Looker!